Around the end of the first chapter, the girl is alone on a beach and meets a friendly man who says some odd, poetic things. (I don't mean he was rhyming all the time.) I think he then kinda-sorta disappears, in such a way that it is at least possible that he has genuine magic powers (although he does not make this claim at that time). From here, the novel somewhat resembles the Mary Poppins books (although written, I'd say, in a slightly more serious tone, and aimed at a somewhat older target audience). That is to say: The mysterious tutor sometimes takes the kids on magical adventures to strange places, meeting nonhuman creatures out of legend, but the adults have no idea that anything extraordinary is taking place. It becomes increasingly apparent that the tutor is more than just a mere mortal, although no detailed "origin story" is ever provided. I have a very vague idea that it may have been hinted, at some point, that he could be Puck, aka Robin Goodfellow. Toward the end of the book, the male cousin is infuriated by something nasty that another boy has said or done, and jumps on the offender and has a vigorous fight with him . . . without the invalid boy using his crutches, or even feeling the need for them, at the time. After some adults have come along to see what the fuss is all about, the tutor says, to the boy's father, something along these general lines: "Sir, I don't claim to be one of those faith healers you hear about, but it seems to me that a boy who can hold his own in a fight with [insert other boy's name] is a lad who doesn't much need those crutches." Which seems to be true, as the invalid boy, after hearing that, manages to walk back to the house under his own power (although perhaps wobbly on his feet). It is implied that the tutor's magical influence over the summer may have had something to do with the boy's recovery. 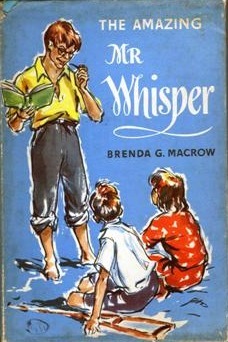 I have a vague idea that the tutor was called "Mister Whisper" or "Mister Whistler" or "Mister Whistle" . . . or something similar, with the surname starting with a "W." Maybe. But I could be wrong! Some Googling, just now, turned up hits for various fictional characters who each have used one of those names, but none of them appear to be the right one. (For instance, a woman named Margaret Mahy wrote a children's book called Mister Whistler, with illustrations by Gavin Bishop, but judging by the reviews on Amazon.com, that definitely is not the one I was remembering.) I also have a vague idea that the word "Summer" may have been part of the title of this juvenile fantasy novel. They were about a mysterious stranger – the eponymous Mr Whisper – who, as I think I remember, became the tutor of a lonely, alienated young girl and opened up a magical world for her. He turned out, I believe, to be something rather high up in the Fairy World. Here's a picture of the cover art, which, as you can see, features a young girl and a young man with a crutch being lectured to by a Puck-like adult (with pointy ears) holding a book. Not the answer you're looking for? Browse other questions tagged story-identification young-adult or ask your own question.